Cetologists identify whales by the scars and general wear of their flukes, their idiosyncratic calling cards slipping into the deep again, marking years by disappearance and reappearance. When we moved in May, I thought I’d do the same with pigeons. They must be as distinctive, I figured, and I meant to know my new neighborhood by its non-human citizens. For a time, on every walk exploring the new streets around us, I scrutinized each bird that lingered on the sidewalk. I meant to memorize a few, sure I’d meet some familiarity eventually. Of course, I failed. The proliferation of pigeon colors and patterns can’t be captured by one mind, at least not one as small as mine. Even if I thought I remembered their odd, mixed variations of gray and white and brown, who could be sure? Was this pigeon a friend? Over the last eight months, since abandoning my blog, I’ve written little, only haiku, and part of me discounts those seventeen (or so) syllables as frivolity, too easy to matter for much. They’re pigeons, perhaps beautiful if you’re prone to scrutinize but likely just another square of a sea’s surface or a patch of sky… more of the same. Maybe. If nothing else, belief intends sense. Each haiku promises content, however fleeting. 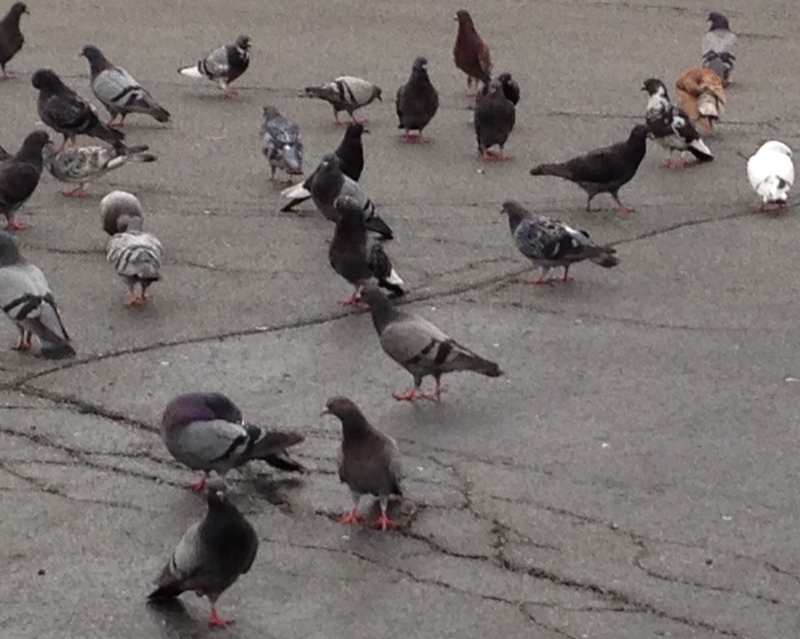 My pigeon friends gather en masse in a parking lot near where I live. A step in their direction sends them wheeling into the air, and every distinction between them vanishes in shuddering wings and new perspectives of their flight. They’re no longer verifiably separate. If haiku accomplish so much, perhaps that’s enough. When I was four, I remember scooting along the curb after a storm, my feet driving a wave of rainwater ahead of me. That instant persists because I seldom feel such power now. I’d like to write something substantial—a novel, a poem worthy of public attention, a collection of essays or short stories—and instead settle for the fitful awareness in haiku—they might add up, or, at the other extreme, one will be the apparition of faces in a crowd, petals plastered against a background making them visible at last. I saw a pigeon recently I was sure I’d recall. It was ginger rather than gray, and one wing feather was a white vee, the other not. Turning to me as if it knew me, its strut faced my direction. I thought it spoke, issuing a challenge to be known and understood. No haiku occurred to me, but I knew then what haiku is. Perhaps applicable to every modicum of matter or energy that exists- everything is beautiful upon informed scrutiny. The natural order dictates that it exists due to some evolutionary or universal purpose, and there is beauty in that purpose. At a temple I visited in Beijing, a guide was telling a story of ancient calligraphers that numbered each hall 1-7 with its corresponding character. While virtually all characters consist of multiple strokes, ‘1’ in Chinese is a single a horizontal line. The single stroke presented far greater risk for the calligraphers, as their entire reputation would depend on one unquestionably flawless motion, with movement and momentum originating from the feet and traversing hips to the arms and wrist. Anything short of perfect angle, shape, and texture of this solitary flat line, and you might as well start using those brushes for kindling. Reminds me of the artistry and history saturated trade-craft of sushi chefs. Seems like an idea or art form or skill’s simplicity democratizes its practitioners or students, and dictates its potential for brilliance- from writing to ornithology.